Apologies if you received my last post twice. I was adding the Pin It button to my side bar to make it easier to pin from your tablet or phone. On a computer, there should be a Pin It button that appears when you hover your mouse over a photo. This is my Millefiori Block 1 of the quilt along from the book The New Hexagon by Katje Marek. Katje gives directions for one block a month from her book, and you can either print the blocks on card stock and cut out the shapes to English Paper Piece or you can order the precut papers from paperpieces.com. To be honest, I've spent way too much time puzzling and trying to figure out what fabrics would look best with the fabrics I've already sewn. The diamonds for the next round are different in the photos that I'm posting. One problem is that there is really no good way to see what the finished block will look like unless you cut the fabrics and sew a couple blocks of each round together. Another problem for me is that these hexagons measure 3 inches on a side. After working on Dear Jane and Nearly Insane, one block that measures 3 inches is huge. And yet another problem is that sewing and twisting these large pieces hurts my hands after I sew awhile. So after working with this block off and on for the last month, I'm going to set it aside and work on it at some other time, or I may re-purpose it into the center medallion of another quilt. I think when a project goes from being fun to something that you dread, it's time to move on. Even Tiki has had enough of this block. Here is an idea I have for the center medallion of a Christmas quilt using the first block from my Christmas Millefiori Block 1. 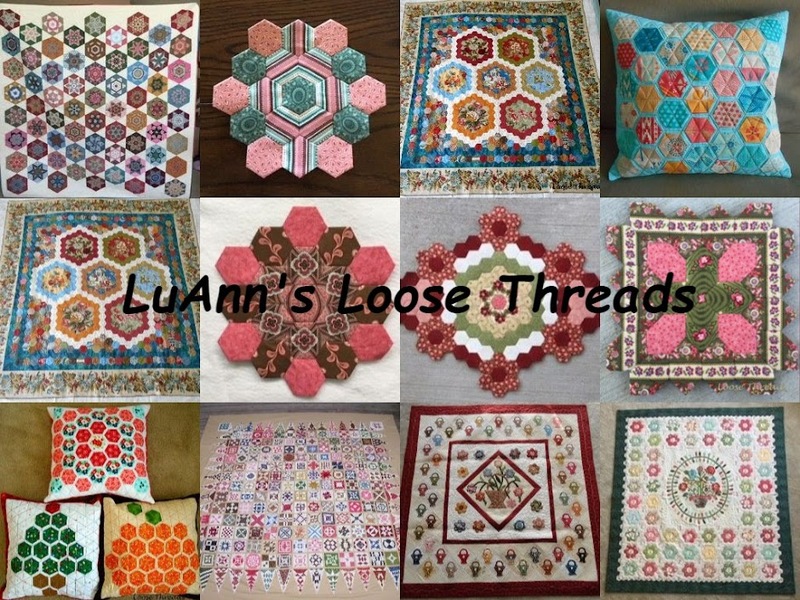 The 6 surrounding hexagons are from the book Pieced Hexies A New Tradition in English Paper Piecing by Mickey Depre. For now I'm going to work on more of my 3/4" hexagons. I'm not sure what this project will be yet, but I love these little blocks. I've been spending some time in my sewing room and have been working on a new English Paper Piecing project. I've joined in on Katja Marek's Millefiore Quilt Along. The blocks come from her book The New Hexagon - 52 blocks to English Paper Piece. This is the beginning of my second block number 1. I stopped working on my first version of the block (the one that will go into my quilt) when I saw someone post a photo of their finished first block in the Millefiore Quilt Along Facebook Group. The photo showed someone's husband holding up a finished block, and that really put the size into perspective for me. I could see this block (which ends up being about 36") as a table topper or the center of a medallion quilt surrounded by smaller hexagons. So I decided to use some of my Christmas fabric to make a Block 1. There are two more rounds to be added to the block after this one. These pieced hexagons are 3" on a side . I have Charlie Brown's Christmas fabric, and have fussy cut the Christmas tree for the next round along with Ruldolph on a gold background. Choosing the fabrics for this and my other Block 1 has really been a challenge, but I'm loving this quilt along. You can see others blocks over on the Facebook group here. We are doing one block a month, and Block number 2 was just posted today, so I need to pick up the pace. You can find more information about this quilt along here. I have a pot of chili simmering and have baked a pan of Spiced Pecans, and I'm ready to watch the Superbowl and stitch.